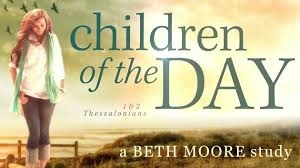 Beth Moore says: 'I'm ecstatic that we've landed together on these Thessalonians shores. Let's not brush the sand off quickly. Let's sit awhile and let the tide come in and wash our eyes with fresh vision for eight beautiful weeks.